Green smoothies are unlike traditional smoothies in that they usually contain some green vegetables in addition to fruits, fruit juice, yogurt, milk and other more typical smoothie ingredients. Having a nutritious green smoothie every day isn’t a bad idea if your goal is to lose weight and improve your health, but you still need to watch your total calorie count to ensure positive results. If your green smoothie contains a lot of vegetables and fruits, you may be helping to prevent your risk of disease as well as guarding against obesity and overweight. According to ChooseMyPlate.gov, fresh or frozen fruits and vegetables have the potential to cut your risk of heart attack, kidney stones, stroke, cancer, diabetes and bone loss. While a smoothie may not seem like an adequate replacement for a full meal, adding vegetables to the blend increases the amount of dietary fiber you eat, which can help you feel and stay full for long periods of time. 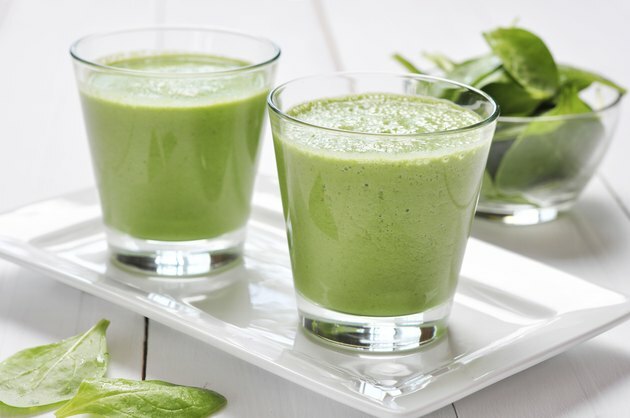 Although green smoothies have plenty of health benefits, no food can “make” you lose weight. To slim down and keep the weight off, you need to consistently eat fewer calories than you burn. There’s no magic food that will allow you to do that; in fact, the Weight Control Information Network notes that you can eat whatever you like and still lose weight as long as you create a calorie deficit. To have high odds of doing that, track your calorie intake every day with an online calorie counter or use a green smoothie as a meal replacement instead of a snack that you have in addition to meals. 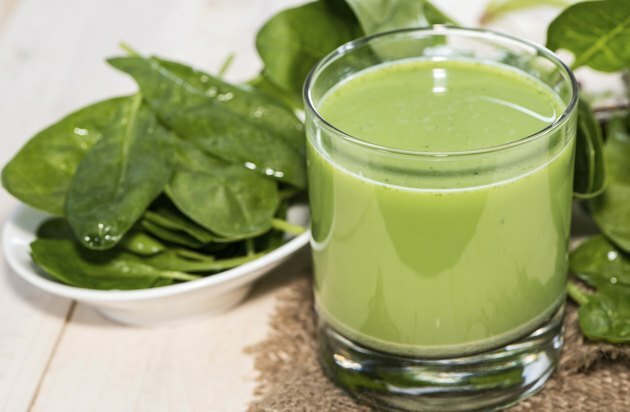 It can take a while to get used to the taste of veggies in your smoothie, so it’s worth starting out with a drink that contains some natural sugar and only a small amount of green. Try building a shake with 1/2 cup of plain nonfat yogurt, 1/2 cup of skim milk, one small frozen banana and 1 cup of fresh spinach leaves. Blend all the ingredients with a few crushed ice cubes until the mixture is smooth. The shake serves one and contains about 215 calories, 12 grams of protein, 4 grams of fat, 40 grams of carbohydrates, 3 grams of fiber and 27 grams of natural sugar. Before you start using green smoothies as a weight loss method, have a talk with your doctor or a registered dietitian to get personalized health advice. Smoothies can’t provide all nutrients that your body needs, so the National Institutes of Health recommend getting daily servings of low-fat dairy, whole grains and lean proteins in addition to fruits and vegetables. For the best chance of losing weight and keeping it off, participate in regular exercise as well as a low-calorie diet.